Be thankful—you can dine out on Turkey Day! That's a lot of sides. Although coordinating a feast for family can be a real reward, for most of us this means spending hours darting in and out of the kitchen while friends and family await your company. And by the time you finally do sit boastfully by your bounty, you're exhausted—long before the turkey-induced coma has had a chance to set in. This year, skip the brining. Forget about the timing of multiple side dishes. Rejoice because you didn't have to wait in a single grocery store checkout line. Head south to The Meadows at The Lodge (Sunriver Resort), where you can get a three-course plated turkey dinner ($39 adults, $19 ages 6-12, and a la carte menu for 5 and under) while feasting your eyes on sweeping views of Mt. Bachelor and the pristine Meadows golf course. Prefer buffet-style spreads or have a large group? 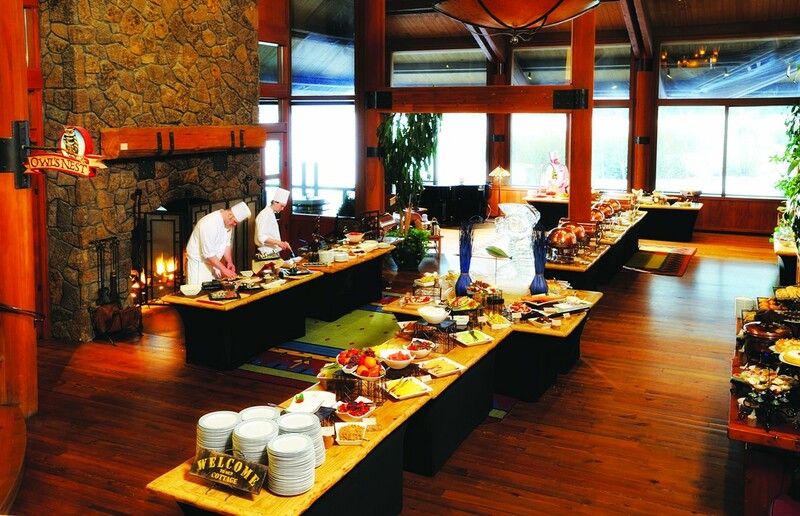 Then opt instead to dine at the Great Hall—a grand, open-beamed "mess hall" near The Lodge. This historic building is the last of Camp Abbot, a World War II training camp for the Army Corps of Engineers, Which is now home to some of Central Oregon's most prestigious weddings and formal affairs. Expect turkey, prime rib, all the traditional sides and a fine display of desserts ($42 adults, $21 ages 6-12, kids 5 and under free). Or instead, head north. Brasada Ranch is one of Central Oregon's newest resorts, on 1,800 acres of rolling hills and juniper, with bike paths, stables and the 18-hole Canyons golf course. In addition to offering free pony rides Thanksgiving morning between 10 and 11:30 a.m., Brasada will be serving perhaps the most gourmet buffet in the area. Executive Chef Adrian Carter will be highlighting Northwest ingredients like pan-seared trout, forest mushrooms and local cheeses. But he hasn't forgotten the traditional favorites—roasted turkey, orange-scented candied yams and, of course, green bean casserole ($38 adults, $14 ages 6 to 18). The buffet will be served in The Barn, a name that does no justice to the contemporary building with wrap-around porches and awe-inspiring sunset views. Football fans, fear not. Brasada's bar will be serving breakfast, lunch and dinner that day, in addition to airing all NFL games. Want to stay even closer to home? Black Bear Diner is a casual compromise for the budget-burdened among us, and a savior for those of us who don't get the day off work. The home-style turkey dinner comes with soup or salad, and several sides ($12.99). McMenamins is another option that won't break the bank. Offering a traditional turkey and maple-glazed ham buffet in Father Luke's banquet room, this feast is appropriate for groups both big and small. Just remember to pace yourself through seconds so you still have room for apple crisp or pumpkin pie ($27 adults, $16 ages 5-12, 4 and under free). Call me crazy, but even when "bird" is the word, sometimes I just want a medium-rare steak or pan-seared fresh seafood. Thankfully, two downtown dining favorites are offering their regular menus along with holiday fare. In addition to their usual ranch-style cuisine, The Blacksmith will be serving spit-roasted turkey and possibly a prime rib—traditional but with a Blacksmith twist, using Executive Chef Bryan Chang's house-made rubs and spices. I'll be out of town, welling with gratitude and soaking up family I rarely get to see. But if I were in Bend this Thanksgiving, I'd be dining at The Jackalope Grill. Word on the street is that Chef Tim Garling will be offering turkey osso bucco as a special that night, as well as a traditional turkey dinner with all the accoutrements. If you're tired of talking turkey, just order off The Jackalope's regular menu. Wherever you choose to go, be sure to call ahead and make your reservation soon; peak times are already filling up. Baste it with butter, smoke it, deep fry it in oil, or impregnate it with a can of beer. Everyone has a favorite way to cook their bird. No matter what your philosophy, brining your turkey is the key to getting juicy results. For a very large bird, you may need to increase the batch by 50%. Simmer everything together for 45 minutes and let cool. Submerge turkey in brine for two days. Remove from brine, roast, slice and eat. Sure, you can always Butterball your way to oblivion when turkey time comes, if you can get over the solution of salt and preservatives pumped into the hormone-injected bird. But this year, dear readers, I implore you to make a more informed choice. Below are sources for free-range, all-natural, locally raised turkey—antibiotic and hormone-free.